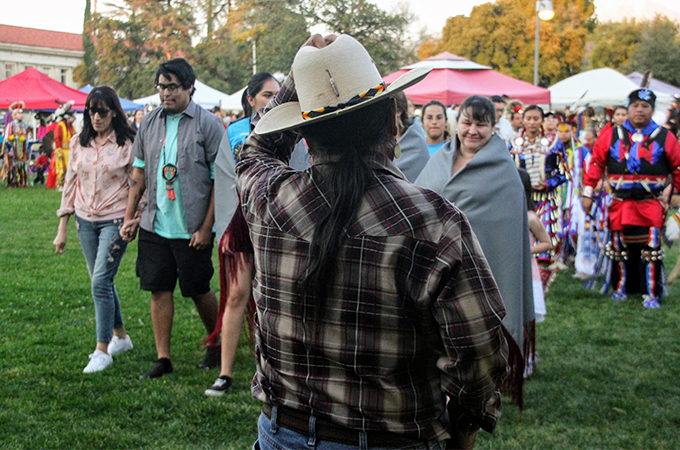 After a three-year hiatus, Native Student Programs hosted the University of Redlands’s third powwow on March 30, 2019. The event, which was open to the public, celebrated Native culture through traditional dances, food, and handmade wares. Katie Olson of the Bulldog Blog sat down with Heather Torres, director of U of R Native Student Programs, made possible through the leadership support of San Manuel Band of Mission Indians, to learn more about the day’s events and their significance. Bulldog Blog: Tell me about this year’s powwow and what it entailed. Heather Torres: A powwow is an inter-tribal ceremony involving folks from different Tribal affiliations and backgrounds. Powwow originated from Tribes in the Plains area. Throughout the years, powwows have become a way to preserve culture, as well as to build community. In the 1950s and ’60s, they became a way for Tribal people, particularly in urban areas, to come together. So powwows developed from being a Plains practice into more of an inter-tribal practice, in which people from different Tribal affiliations engage in learning powwow songs and dances. Part of powwow is social but also ceremonial. The dancers’ primary purpose isn’t just to perform or be an exhibit but to be in ceremony though dancing, praying, singing, and just being with each other. The social part is that, since it is open to the public, everyone gets to come and enjoy it. There are various dance styles throughout the day, and anyone can participate during the inter-tribal songs. Usually, powwows have an arts and crafts component as well, where Native artisans can share and sell their products. This year, we had vendors selling blankets, jewelry, t-shirts, and so on. There were also informational booths from Native organizations, as well as different food vendors. A U of R alumnus ran a booth selling fry bread, which is recognized as a part of Native American cuisine. Fry Bread is made with flour, lard, and salt—ingredients that the U.S. government rationed out on reservations at different points in history. There were also homemade tortillas, red and green chile burritos, and kettle corn. What made the powwow really special this year was that two Native Student Programs alumni were a part of our head staff for that day. The head woman dancer was Dominique Lombardi ’17 and the head man dancer was Darren Henson ’18 and current MBA student. There were even people who came from out of state. It was a really cool day. BB: How was this U of R powwow different from others? HT: In 2014, our powwow actually started out as a competition-style event, in which drum groups and different dancers in the various dance categories competed for prize money. Native Student Programs had a sponsor at the time who helped pay the rewards. This year, it was done in a community style, where everyone gathered and celebrated on the Quad. BB: Does each dance have a specific meaning? HT: During the powwow itself, there are many different dance styles featured and each carries its own meaning. Each dance has its own origin story. Sometimes a powwow will feature a gourd dance, usually before the Grand Entry in the middle of the day. The Gourd Dance is a separate ceremony that comes from Tribal war societies or warrior traditions. It is a men’s dance to honor warriors. Today, many of our Native veterans dance Gourd. BB: What does the day mean to both Native and non-native people? HT: It’s a space to build community with each other. Families and kids come and play together and start building connections. Some groups that have consistently attended powwows have grown to be like family. It’s an opportunity to learn about each other, too. BB: What are the common misconceptions or stereotypes about powwows and Native culture? HT: People tend to think there’s a lot of romanticism involved in powwows. A powwow is a ceremony. Dancers are expressing their prayers for their families and communities—it’s not really a magical thing. Other common errors are referring to the regalia that dancers wear as “costumes” and thinking the powwow’s primary purpose is performance; participants don’t only dance for people to watch or take pictures. BB: What’s the importance of recognizing Native culture in this way on campus? HT: When I was an undergraduate student at University of California, Los Angeles, (UCLA), our powwow made me feel like I belonged. I think it plays a similar role for our students here. When you’re looking around at the powwow and see the Chapel in the background, you feel like you’re meant to be here. Powwows are really important community gathering spaces to the Native community in Southern California. They are also a chance for a piece of Native cultures to become the dominant culture for the day and to expose non-native students to that cultural piece in a safe and comfortable way. BB: Was there a particular highlight for you during the event? HT: There were so many. One that stands out is when we were able to honor our Native Student Programs graduating seniors in the arena. The female students were given custom-made Redlands shawls and the male students were given custom-made Redlands ribbon shirts. Everyone gave them blessings and best wishes for their futures and one of our host drums sang an honor song for them. It was so cool seeing them walk around and receive everyone’s prayers and well wishes. BB: Were the goals of the event accomplished? HT: Yes, our goal was to bring the community together in multiple facets—including the campus, non-native, Native, and off-campus communities. An overarching goal for Native Student Programs is to engage the community as much as possible. We wanted to make sure that the off-campus Native community felt like the campus was comfortable and accessible, which allows for relationships to develop between that community and our students. Another goal is to make sure we’re supporting Native students through graduation. Holding an event that lets them know that they belong here is one way of doing that. 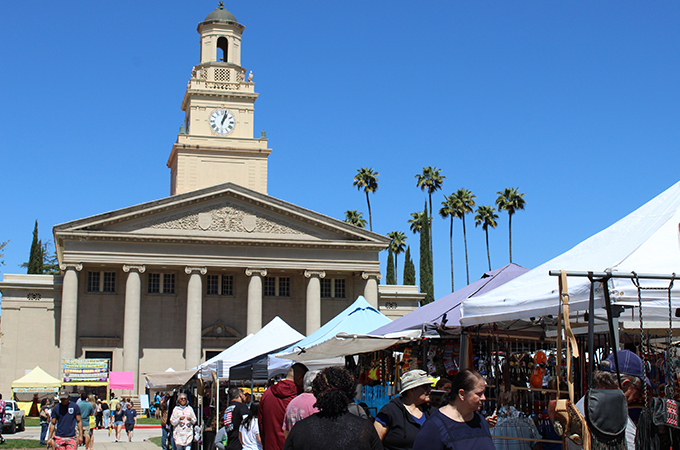 Learn more about Native Student Programs at the University of Redlands.